This year, as such, I’ve channeled my already limited Halloween spirit into home decor, instead. Out front I have two mums that I haven’t killed yet (I’ll consider this an early Christmas miracle…) and a pumpkin that hasn’t rotted yet (mostly because I haven’t carved it yet…) In the kitchen I have a pumpkin with W’s name painted on it (gifted by his Gamma) and a Halloween floral arrangement (I totally bought it at the supermarket). In the bathroom I have a Halloween Yankee Candle along with hand soap in a pumpkin dispenser and a Halloween themed hand towel (all three also gifted by Gamma. She’s good at decorating for the holidays. I think she knows I’m usually too lazy busy.) One thing I do have totally figured out is the candy situation. I’ve already taste tested all of the candy. Several times. I feel confident that the one Milky Way bar we’ll have left will be delicious. If I don’t eat it before then. No promises. Ok, but onto the lion bit of this whole story. 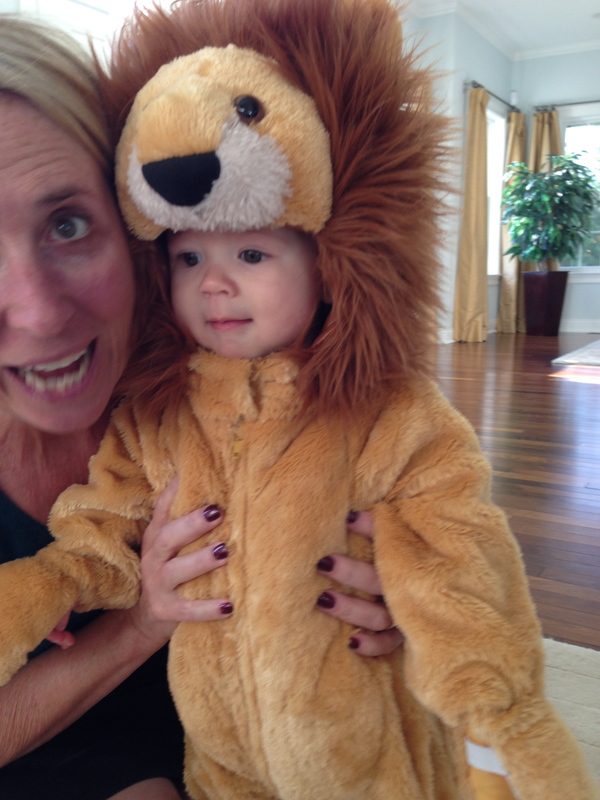 My sister-in-law let us borrow an adorable lion costume that my nephew wore two years ago. (He’s an April baby and W is a February baby so for the most part, thankfully, W has been able to fit into his clothes at the right time of year.) So I was obviously looking for more than one occasion to put my little pumpkin in this cute suite! 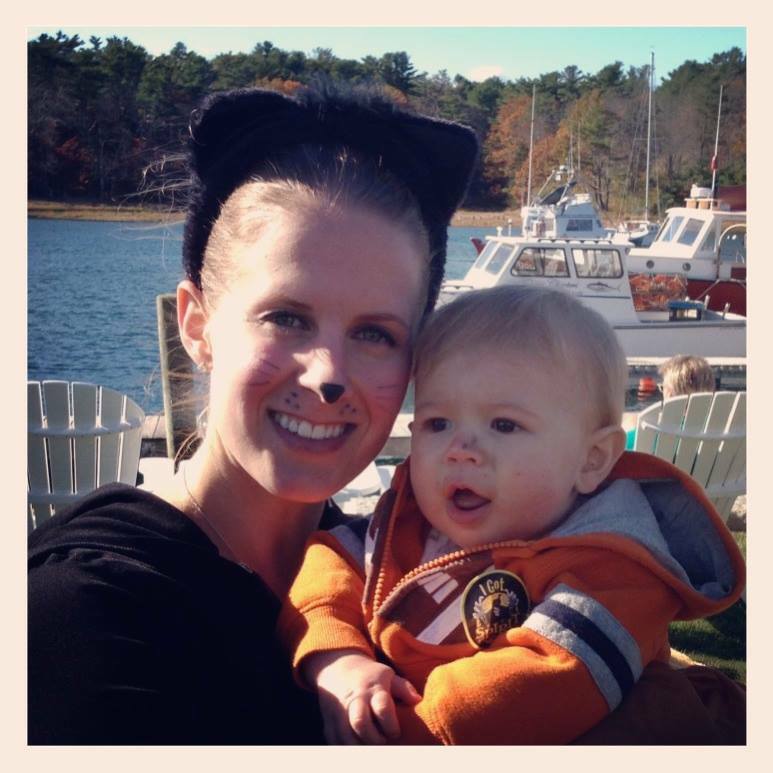 It was perfect that one of my mommy friends suggested we run a Wicked 5K in beautiful Kennebunkport, ME to benefit the Center for Grieving Children (where one of my good friends works!) What a great way to dress the kiddos up, finally meet each others husbands, participate in some Halloween fun at a time of day that the babes are awake for, AND benefit a good cause. I was sold and the hubby was in, too. He’s super fit and active, but running is not in his repertoire. I was worried I’d have to do some arm twisting…but I guess he couldn’t resist a challenge 🙂 I wrote it on my lovely white board in my kitchen and had grand visions of training. We even borrowed a jogger from a neighbor. Welp, per usual, I was mistaken. My post-baby-body just wasn’t having the whole running thing – it was killer on all of my joints. Nonetheless, I’m a sucker for doing anything with my hubby and it was pretty sweet to see him lace up his running shoes and push the jogger. The day and the location along the water at the Nonatum could not have been more perfect. The air was super crisp, the sun was shining and the 200 participants (many of them families with little ones) were dressed in festive gear. W was pretty entertained by all of the costumes and colors and attention he was getting. We were a tad nervous to see how W would do in his majorly furry costume, strapped in a stroller for 30+ minutes, approaching nap time…and, low and behold, minutes before the race was about to begin he was screaming. Oh boy, we thought. This is going to be a LONG race! But, as usual, W pulled himself together. We huffed and puffed our way up, down and around the beautiful neighborhoods…peeking at our little lion who was just taking in the scenery and having a blast. His amazingly thick costume came in handy as we rounded the final mile with the sparkling ocean flanking our left side and a stiff breeze blowing in our face. We finished in 34 minutes, and though we didn’t get in under 30 minutes as the hubby had hoped, we crossed the finish line as a family and with a smile 🙂 It was perfect! The after-party, as with most races I’ve run, is pretty much the reason I sign up in the first place…free food and free beer. So, my friend and I left the babies with the guys and grabbed ourselves a plate of food and a yummy Allagash White before returning to our precious little families, sitting on picnic tables and Adirondack chairs along the ocean. Ah. Life is good. And Wyatt even fell asleep on the car ride home. Life is really good…minus the major clogged duct that was brewing. Now, though, it’s time for the Red Sox!